When you think about losing weight, the first thing that comes to your mind is to eat less. Most of the people who want to shed those extra pounds cut on their regular diet, which is not a really good idea. It causes nothing but a weaker body due to less supply of nutrients. 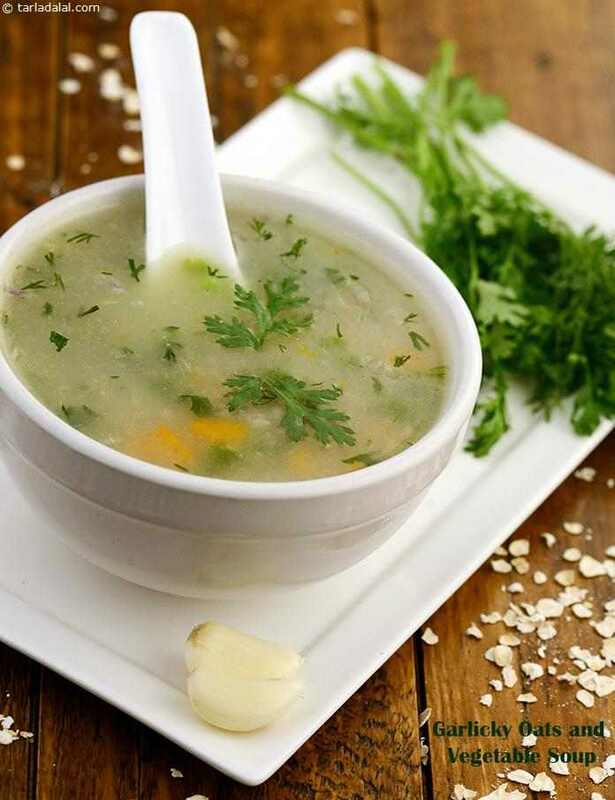 Here are some soup recipes for weight loss that will keep you healthy and help remove that extra fat from your body too. All of these recipes are tasty as well as healthy. 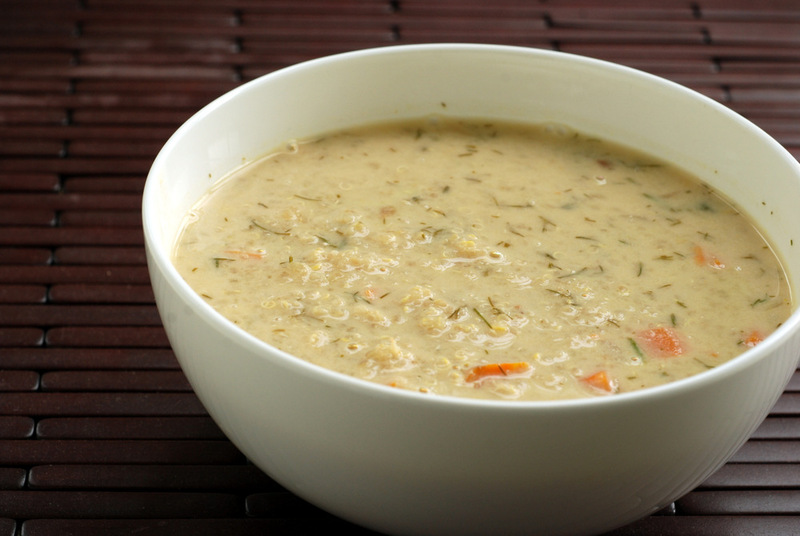 Go through the list of healthy soup recipes for the sake of a healthier and leaner body. Heat the oil in a pan and saute onions for two minutes in it. Add cauliflowers to it. Saute it for 3-4 minutes. Now, pour milk and half a cup of water into the pan. Mix the ingredients well and cook for ten minutes while stirring in between. Let it cool down completely. Afterwards, blend the mixture until smooth. Now, pour the mixture back to the pan and add celery, pepper, salt and half a cup of water. Cook for two minutes after mixing well. Keep stirring the soup. Serve it immediately and consume while still warm. First, heat oil in a pan. Add garlic and onions to it and saute for a couple of minutes on medium flame. Now, add mixed vegetables to it. Pour three cups of water into the pan and add salt and pepper to it. Cook for two minutes after mixing well. Stir it occasionally so that it doesn’t get burned. Add coriander and oats to it and mix properly. Cook for a minute on medium flame. Serve and consume hot. Roast mint leaves in a pan till they are crisp. Crush them and put aside. Properly clean red lentil and rice with water and then drain. Pour them in a pressure cooker. Add carrots, onions and tomatoes along with two cups water to it. Cook it for two whistles. Blend this mixture until smooth. Simmer for a few minutes after adding milk, roasted mint, chilli flakes, half a cup of water and salt to it. Serve the soup hot. To prepare pepper and cheese cottage balls, mix and knead all the ingredients in a bowl. After dividing this mixture into 20 equal portions, make small balls from them. Microwave them for twenty seconds. Let it cool for some time. You can also use a steamer to cook balls. Now, heat the oil in a pan. Saute onions for 10 minutes on a low flame. Wait till it turns to golden brown colour. Add vegetable stock, pepper and salt to it. Bring it to boil. Mix corn flour in 1/4 cup of water and add it to the soup. Simmer the mixture for five minutes. Now, add pepper and cottage cheese balls to the soup. Serve it hot after garnishing with parsley. 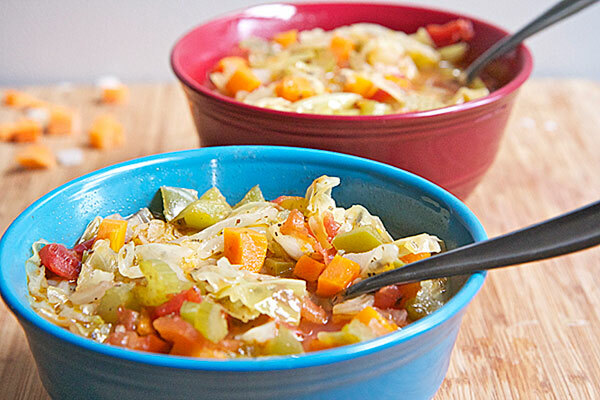 Take a large pot and add carrots, bell peppers, cabbage, onions, celery, tomatoes and green beans to it. Pour onion soup mix, beef broth, tomato juice in it and enough water to cover the vegetables. Simmer the mixture until vegetables are tender. You can store it in the refrigerator for several days. You need to rinse millet and soak it in water for 8 hours. Afterwards, drain it and put aside. Pour oil into a pot and heat it on a medium flame. Add celery, garlic, onion, carrot and ginger to it and stir for five minutes. Pour water or vegetable stock and celery seed into it. Bring the mixture to boil. Simmer over a low flame for fifteen minutes after covering it. 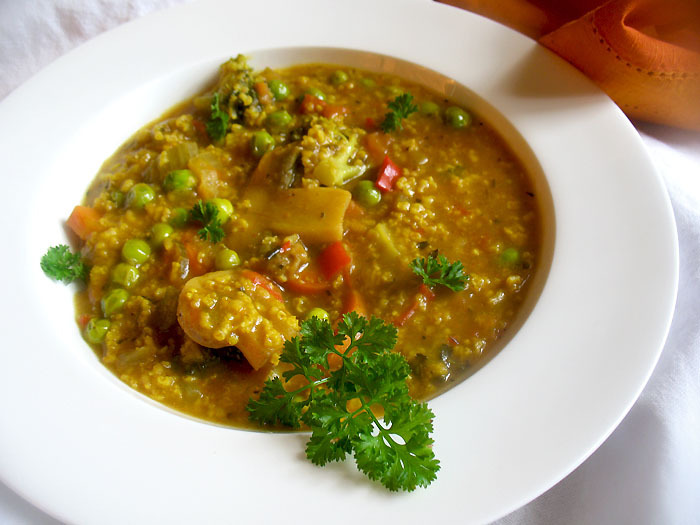 Add broccoli stems, chillies, mushrooms, millet, tomato, herbs and spices to it. Cover it and simmer over a low flame for 20 minutes. Make sure that millet is properly cooked. Now, add tamari, peas, black pepper and broccoli florets to it. Squeeze lime juice and cook for another 10 minutes. Garnish it with parsley. Serve hot! Preheat the oven to 350 degrees. Take a large metal bowl and put onion, pumpkin and garlic in it. Now, mix olive oil, butter and maple syrup in a small bowl. Pour this mixture over pumpkin seeds. Place pumpkin on a baking pan. Make sure that all the liquids are properly transferred to the pan. Place bay leaves between pumpkin cubes after tearing them into four pieces each. Roast it for half an hour until pumpkin cubes are softened. Later, pour cold chicken broth and cooked pumpkin in a blender and blend until desired consistency. 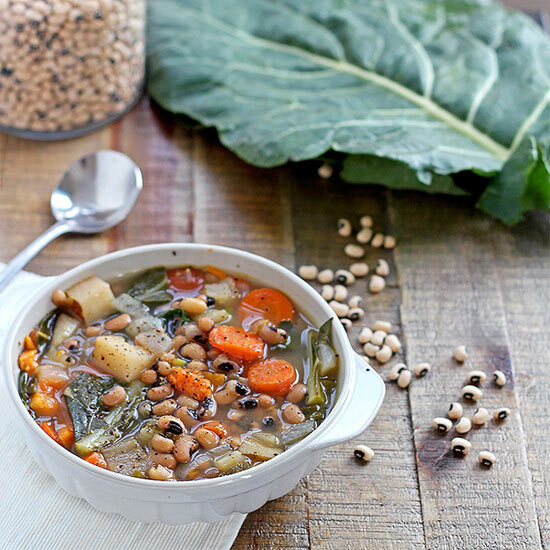 Pour this soup in a pot and simmer on low heat. Mix pepper, chilli pepper and salt to taste. Garnish it with pecans when it is thickened to the desired texture. Heat oil in a pan. Saute onions on a medium flame in it for a couple of minutes. Add vegetable stock, asparagus and potatoes to it. Bring the mixture to boil. Cover the pot and simmer on low flame for 8 minutes. Let it cool for some time and then, blend to a smooth puree with 2 cups of water. Transfer the puree to pan and add milk, pepper and salt to it. Cook for 1-2 minutes on a medium flame. Stir it occassionally. 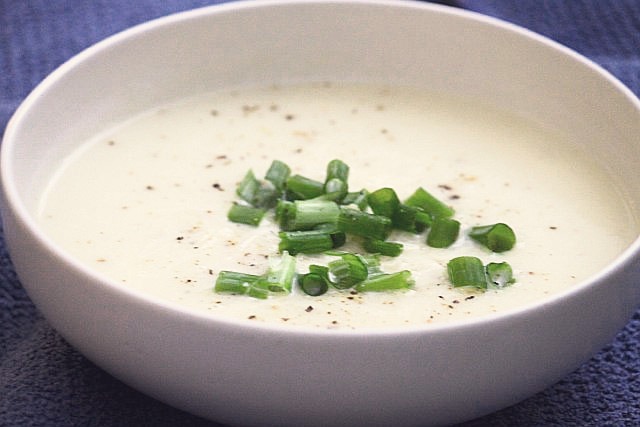 Serve this soup hot with chopped asparagus. Heat oil in a pot over medium flame. Saute onions in it on a lower flame for five minutes. Add celery to it and cook for 4-5 minutes. Now, add garlic to it and saute for one minute. Add potatoes, cauliflower and stock to it. Stir well and bring it to a boil. Lower down the flame and cover the pot. Simmer for 15-20 minutes. Make sure that everything is tender. 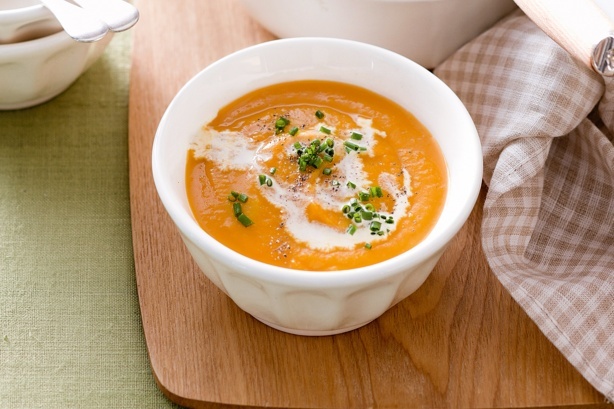 Blend this soup using an immersion blender until it is smooth. Add water or stock as desired. Mix salt in it. Garnish it with sour cream, chives, cheese and black pepper. Serve it hot. Take a deep non-stick pan; add cucumber with one and a half cups of water in it. Cook for 10 minutes on a medium flame. Keep it aside to let it cool down. Mix cucumber, curd, milk and salt in a bowl and blend until smooth. Put it aside. Heat butter in a pan. Add chopped cucumber and capsicum to it and saute for 2 minutes over a low flame. After removing from flame, add cucumber-milk mixture and mix all the ingredients well. Refrigerate it for half an hour. Garnish it black pepper and mint leaves. Serve it chilled. Heat oil in a pan over medium flame. Add carrot, shallots and salt to it. Cook for about ten minutes until shallots are translucent. Now, add garlic to and saute until fragrant. Add quinoa, vegetable broth and a dash of salt to taste. Bring it to boil. Simmer on a lower flame for about 20 minutes until carrots and quinoa are cooked. In the meantime, beat tahini, miso and lemon juice until smooth. Pour this mixture into the soup after it gets prepared. Also, add dill and nutritional yeast to it. Mix it properly. Heat oil in a non-stick pan. Saute garlic and green chillies for a few seconds on a medium flame. After that, cook onions for a couple of minutes. Now, add cabbage and carrots and saute for one minute. Add lemon juice, vegetable stock, cornflour-water mixture and salt to it. Mix it well and cook for 2-3 minutes. Keep stirring in between. Sprinkle coriander over it. Serve it immediately. 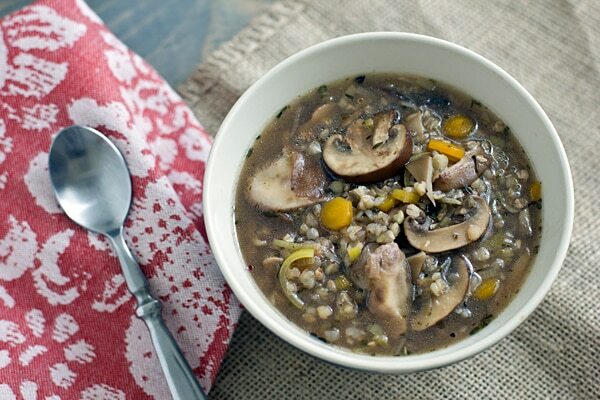 Soak mushrooms in warm water. In the meanwhile, heat a tbsp of oil in a pot over medium flame. Add celery and onion and cook for five minutes. Keep strring until it starts to soften. Add the remaining oil and now, cook over a higher flame. Add fresh mushrooms and salt to it. Cook for about 10 minutes until mushrooms start to brown. Stir it occassionally. Strain dried mushrooms and reserve 1 1/2cup of soaking water. Chop mushrooms and add them to the pot. Mix paprika, bay leaf, buckwheat, cayenne and tomato paste in it. Keep strring for about three minutes until buckwheat and mushrooms are coated. Now, add beef broth, wine and soaking water. Bring soup to boil by increasing the heat. Lower the flame and simmer, while partly covered, for 15-20 minutes until buckwheat is tender. Mix herbs and vinegar in it. Now, add salt and black pepper to taste. Heat olive oil in a pot over medium heat. Add garlic and onions to it and cook for about 5 minutes until onions are translucent. Now, add carrots, yam, black-eyed peas, potatoes, collards, oregano, vegetable-stock and basil to it. Bring it to boil by turning the flame high. Reduce heat after covering it. Cook for 20-25 minutes until vegetables are tender. Mix in apple cider vinegar and add salt and pepper to taste. Mix corn, peas, onion, salt, garlic and four cups of water in a pot. Cook for 10 minutes until all the ingredients become tender. Let it cool. Blend the mixture until smooth like a puree. Add milk, mint, coriander and salt to it, just before serving. Bring it to boil. Serve the soup hot! Heat oil in a large pot. Saute carrot, onion, jalapenos and cabbage in it for 10 minutes until they get soft. Now, add pepper, crushed tomatoes, brown sugar, salt, chicken breast and apple cider vinegar to it. Stir properly to combine all the ingredients. Simmer the soup for 20 minutes over medium heat. Serve it hot. To make the soup, you first need to heat oil in a large pot. Saute garlic, onion, carrot and rosemary for 8-10 minutes. Add stock and beans to it. Simmer for 20 minutes while stirring it occasionally. Now, add pepper and salt to it. Let it cool for sometime. Blend it properly and pour the mixture into the pot. Simmer over low heat and start preparing the kale. Heat olive oil in a large frying pan. Add miso to it and cook for 5 minutes or until it becomes fragrant and begin to caramelize. Now, mix red pepper flakes and garlic in it and cook for another minute. Saute this mixture for five minutes after adding kale to it. Keep stirring in between. 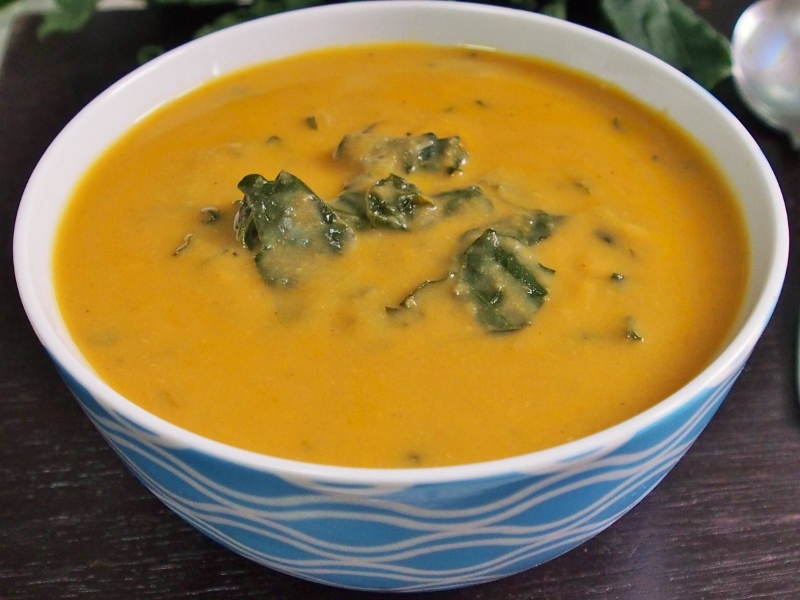 After pouring the soup into four bowls separately, top it with kale. Serve the soup hot. Take a large stockpot and warm olive oil in it. Add cumin seeds to it and saute until they begin to pop and fragrant. Now, add garlic and onion to it and cook for 5-10 minutes. 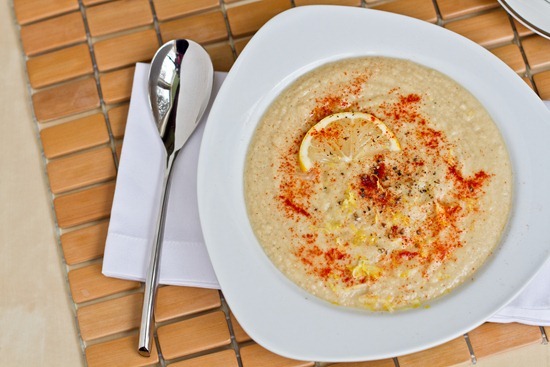 Mix tahini, chickpeas, and vegetable broth in it and stir properly. Gently simmer the mixture (don’t boil) for 5-10 minutes. Now, remove the mixture form heat and add lemon juice to it. Season it with salt and pepper to taste. Serve it warm! Heat coconut oil in a large stock pot; saute thyme and fennel seeds in it for about a minute until it becomes fragrant. Add butternut squash, onion and pepper and salt to taste. Cook the mixture for another 5 minutes. Make sure that vegetables begin to soften. Add vegetable broth to it. Cover the pot and bring the mixture to boil. Simmer for twenty minutes till the squash turns soft. Let it cool slightly. Pour soup in a blender and add almond butter to it. Blend it until smooth. Pour the soup back into the pot and reheat for sometime. 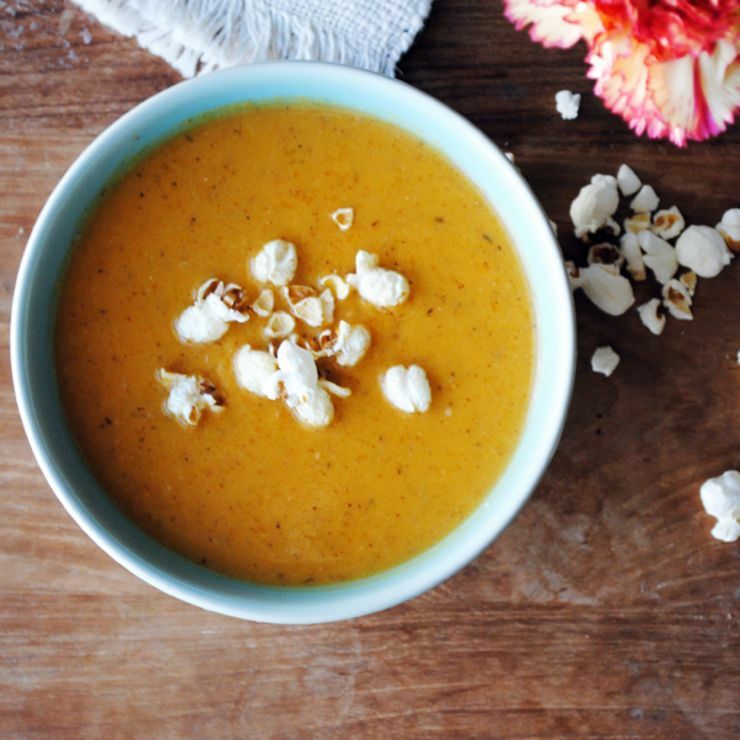 Pour soup in four different bowls and top it with popcorn. Serve the soup hot! Take a pot and heat olive oil in it. Saute celery, butter squash and onion for sometime until they are soften. Add rosemary, thyme, garlic, red pepper flakes, salt, and pepper to it. Saute for another minute. Now, add crushed tomatoes, frozen spinach, vegetable broth, kidney beans, kamut, and parmesan cheese rind to it. Cover the pot and bring the mixture to boil. Reduce the flame and simmer for about one hour until kamut becomes soft. Keep stirring occasionally. Serve and eat hot. Saute garlic and onion in a large pot for 5-7 minutes until begin to soften. Add one and a half cup of water and barley to it. Cover the pot and bring it to boil. Simmer the concoction for half an hour until becomes tender. Stir in yogurt, vegetable broth, and pepper and salt. Simmer the mixture for 5 minutes. Add parsley, dill and lemon juice to it. Serve hot. Add carrots and onion to heated olive oil in a large stock pot. Saute for 5 minutes until they are soft. Add tomato paste, garlic, ginger, and spices. Cook for a minute until fragrant. Now, mix crushed tomatoes, lentils, and vegetable broth. Sprinkle salt and pepper in it as per your taste. Cover the pot and reduce heat after a boil. Simmer the soup for 45 minutes until tender. Keep stirring it in between. Top it with yogurt, if desired. Serve and consume hot! To prepare it, you first need to soak cashews in hot water. Drain the water and blend cashews with a cup of vegetable broth until it is smooth. Keep it aside. Saute garlic, onion, and broccoli in the canola oil in a large pot for 4-5 minutes until onions are soft and broccoli is bright green. Now, add the remaining vegetable broth along with the cashew mixture and soy sauce. Simmer the mixture for 10-12 minutes until broccoli is completely soft. Let it cool slightly then blend it until smooth. Now, pour back the soup in the pot; add pepper, salt and ACV to it. Simmer for 5 minutes and serve it hot. Take a large pot; add oil in it and heat it on a medium flame. Add garlic and onion to it and saute until soften. Now add it to a blender and add tomatoes with juice and chipotle to it. Blend it until smooth. Pour it back to the pot and add broth to it and simmer the mixture. Use salt and pepper to season the chicken. Now, add breasts to the liquid whole. Cook them in the soup for about 10 minutes. Remove them and slice thin just before serving. Preheat the oven to 450 degree F. Put the tortilla strips on a baking sheet and bake them until they are crispy and lightly brown. Now, season the soup with lime juice and salt, pepper, and hot sauce. Divide the soup into four bowls. Top it with tortilla strips, chicken, avocado and other garnishers of your choice. Take olive oil in a large pot and heat it over medium flame. Saute garlic and onion in it for about 3 minutes until onion is translucent. Add zucchini, beans, carrots and potatoes to it. Sprinkle a pinch of salt to season it and cook for 3-4 minutes while stirring. Wait till vegetable aromas are released. Now, add thyme, stock and tomatoes to it. Lower down the flame. Season with pepper and salt to taste. Simmer for 15-45 minutes. Stir in the white beans and heat it. 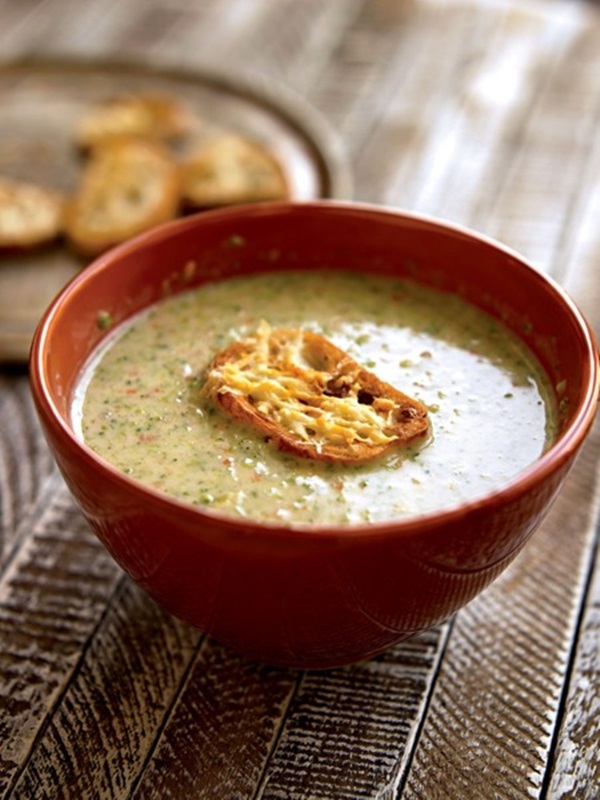 Serve the soup with a dollop of pesto and a bit of grated parmesan. Take a large pot and heat butter over medium flame. Saute broccoli, carrot, garlic, and onion for about 5 minutes until vegetables become soft. Add flour into it and cook until vegetables are properly coated with it. Now, pour beer and stock into it and stir strenuously to stop the flour from clumping. Cook for a few minutes and then, transfer the mixture to a blender and puree until smooth. Now, return the soup back into the pot and cook on a low flame. Add cheese and milk to it. Season the soup with pepper, salt, and tabasco. While serving, put crisp parmesan floating in the middle of each bowl. Put a large soup pot on stove and heat in on medium flame. Pour bacon into it and cook for 5 minutes until it becomes crispy. Remove it using a slotted spoon and put aside. Keep only a thin film of bacon fat and discard the rest of it. Now, add garlic and scallion whites to the pot and saute for two minutes until scallions are translucent. Stir in the flour and mix it properly so that it coats the ingredients well. Pour the chicken stock into it and whisk to prevent any lumps from forming. Take one of the baked potatoes and peel its skin. Chop it and add to the pot. Mash the potato into the broth using a potato masher. Puree the soup in the blender to make it smoother. Cut another potato into cubes along with the peel, and pour it into the soup following half-and-half. Then, sprinkle black pepper and salt to season the soup.Lower down the flame and keep simmering for 5-10 minutes. Pour the soup into bowls and use bacon, a bit of shredded cheddar cheese, scallion greens, and a few shakes of tabasco to garnish it. Preheat the oven at 400 degrees. Take a baking sheet and toss cauliflower on it with a tsp of olive oil, pepper, salt and half of coriander. Roast it in the oven for half an hour until golden brown. Toss it halfway through cooking. Peel the carrot and dice it finely. Cut shallot in the halves, and peel and dice it into pieces. Slice the garlic into thin pieces and chop the cilantro. Heat a drizzle of oil in a large pot over medium flame. Add carrot, shallot, and the remaining coriander to it. Cook for 5 minutes, while tossing, until it is softened. Add the garlic to it and cook for another minute until you feel its fragrance. Stir in coconut milk to the pot and bring it to boil. Lower the flame to simmer for 5 minutes. Pour the pumpkin puree and stock concentrate along with a cup of water. Simmer the soup again and season it with pepper and salt. Once the cauliflower is ready, pour the soup into bowls, and put the cauliflower florets in the middle of each bowl. Garnish the soup with pumpkin seeds and cilantro. Enjoy it when it is still warm! Defrost chicken and cut it into bit-size pieces. Season it with Italian seasoning. Put the chicken in a small skillet and cook over the stove top. Take another medium-sized frying pan and heat olive oil in it. Add onion, garlic, and carrots to it. Wash kale using water and add it to the mixture. Saute for a few minutes. Take a medium-sized pot filled with water. Cook potatoes in it until they become soft. In the meantime, add chicken broth to the frying pan. When potatoes and chicken are cooked, add them to kale and chicken broth mixture. Simmer it for 10-15 minutes. Keep stirring it and taste periodically. Now, add pepper and salt as required. Take a large pot; put bacon in it and cook for 5 minutes over medium flame until it is crispy and brown. Once it is cooked, put it on a paper-towel lined plate and keep it aside. Mix celery and onion with the bacon fat, and cook for about five minutes until it is soft. Now, stir in the flour in this mixture and cook for another minute to eliminate the raw taste of the flour. Pour reserved clam juices, milk and bottled clam juice into it. Stir it steadily to make sure that flour is properly assimilated. Bring this mixture to simmer and add thyme and potatoes to it. Now, simmer for another 10 minutes until potatoes are soft. Season the soup with pepper and salt. Add the clams and simmer to heat the soup just before serving. Garnish it with the reserved bacon. Add butter to a large pot and heat it over a low flame. Add salt and onion to it and cover the pot. Cook the onions for about 30 minutes until they are softened and caramelized. Check the onions and stir them after every 10 minutes. Add thyme (if using), broth, bay leaves, and wine to it. Simmer the mixture for 15 minutes on a low flame. Season it with pepper and discard the bay leaves. Serve the soup and top each of them with some cheese and a slice of baguette. Broil it for about 3 minutes until the cheese starts bubbling and is properly melted. Take a large pot or saucepan and heat olive oil in it over a medium flame. Saute carrots, onions, celery, and garlic in the heated oil for 5 minutes until vegetables are soft. Now, add potatoes, bay leaves, split peas, ham hock, and water or stock to it. Lower down the flame and simmer for 40 minutes. Make sure that peas become soft and start losing their shape as it will give a thicker texture to the soup. Take out the ham hock and scrap the meat clinging from the bone and, add it back to the soup. Remove the bay leaves. Add pepper, salt, and tabasco to season it. Take the oil in a large pot and heat it over high flame. Sprinkle pepper and salt over beef to season it. Sear the beef for 3-4 minutes on all the sides until it gets brown. Transfer it to a slow cooker and add the stock, soy sauce, garlic, water, ginger, star anise, and onions to it. Now, cook this concoction on a low flame for 6 hours until beef becomes really soft. You can also simmer all the ingredients in a large pot over a very low flame for 2-3 hours. When the beef is about to ready, prepare the noodles according to the instructions provided on the packet. Now, add the bok choy to the soup and simmer for about 10 minutes until it becomes soft. Add salt and black pepper for seasoning. Pour the noodles in different 8 large bowls. Pour in the broth and bok choy along with the beef. Serve it with your favorite toppings. Pour a tbsp of olive oil in a large skillet and heat it on a medium flame. Place beef in the heated oil and cook until it is not red anymore. Start cooking barley according to the package instructions in the meantime while beef is being cooked. Take another skillet and heat the remaining one tbsp of olive oil in it. Add celery and carrot to it and cook for 5 minutes. Now, add garlic to it. Saute for another 5 minutes and then, pour broth and onion powder to it. When the beef is finally cooked, add it to the pan. Keep stirring occasionally. Take large bowls and pour the mixture into them. Once barley is cooked; add it to the bowl. Mix all the ingredients together. Add pepper and salt to taste. 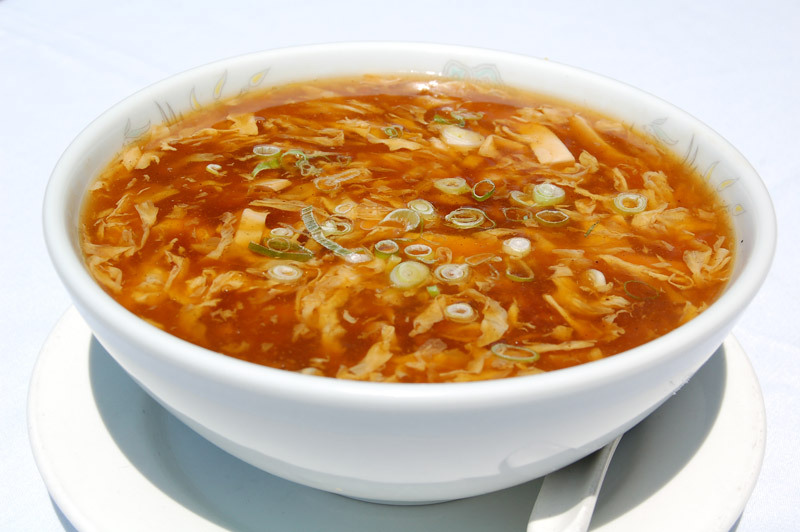 Enjoy this yummy soup! I love soup, and these soup recipes are amazing. The article gave lots of choices, and I will have a chance to try a new one everyday. Maybe I will start with Split Pea Soup first. Gonna save these recipes to my laptop.